Yet another ‘puzzle’. This time it’s a small algorithm to take the intersection and union of two lists. What beter language to do “LISt Processing” than Scheme! You are given two linked lists of integers with no duplicates. The intersection of the two lists is a list of integers that are in both lists, and the union of the two lists is a list of integers that are in either list. For instance, if list A contains the integers 4, 7, 12, 6, 17, 5 and 13 and list B contains the integers 7, 19, 4, 11, 13, 2, and 15 their intersection is the list 4, 7, and 13 and their union is the list 4, 7, 12, 6, 17, 5, 13, 19, 11, 2 and 15. So basically this is the most naive implementation you can think of. We loop over both lists. For each list, if the current element is in the other list, we add it to the intersection. If the element is not yet in the union, we add it to the union. Obviously, this is not very performant. Each call to member will search the entire list. So worst case this is O(n). And we do this for each list’s elements. We have an iteration for each list’s element, but we do them both in a single loop which results in a time complexity of O(max(n, m)). For each element we search the other list, which takes O(n) and O(m). We also need to check the union- and intersectionlists. This again, takes worst case O(n + m) for the union and O(max(n,m)) for the union. This was by far the easiest solution yet. This time, we sort both lists. Assuming the implementation of sort is in O(n log(n)), the total time complexity of the sorting is O(n log(n)). Afterwards, we gobble up both lists. If both elements are equal we add them to the intersection and union. If they are different, we add the smallest one to the union and cut it off the list. All these operations are in O(1) time complexity so we can say that we have a total time complexity of O(n log(n)). This solution required some trickery and is, in constrast with the previous solutions, it requires a working vector. We iterate over both lists once to determine the minimum and maximum value. From these values we create a vector. With this vector we iterate over both lists again. For each number n in the list we increase the value in the vector on position n with 1. This makes sure that elements that are in the intersection will have a value of 2 in the vector, elements that are in the union will then have a value of 1. Elements that are absent will have a value of 0. Then the only thing we need to do is iterate over the vector and add the indices that have a value of 2 to the intersection and add the indices that have a value of 1 to the union. And done. This is a problem that is very well suited to be solved with streams. Streams are available in a number of programming languages like Scheme or Haskell. As this was an excericse for my Haskell course I’m obviously going for Haskell here. We can represent a list of all possible positions as [[(Int, Int)]] where the first value would be the row and the second one the column. But there is a small trick possible here. We know that the array is indexed from 1 to N. Every column on our board will have exactly one queen (if not there are 2 or more queens on one row and they will fight). This means we can have the column for each queen defined in an implicit manner, namely the array position. So we will represent our queens this way: [[Int]]. Second step: What to filter..? But we can immediatly see that [2,2] and [1,1] are no valid solutions because queens can attack eachother. This means that every value in the list must be unique between 1 and N. How do we generate these permutations for the list [1..N] ? Third step: How to filter? We’ve already taken only the permutations, this means that we never have a queen on the same row/column. So we only need to filter out the lists that contain queens that are on the same diagonal. When are two queens on a diagonal? This happens when the distance between two columns and two rows is the same. You can draw this on a paper if you like. 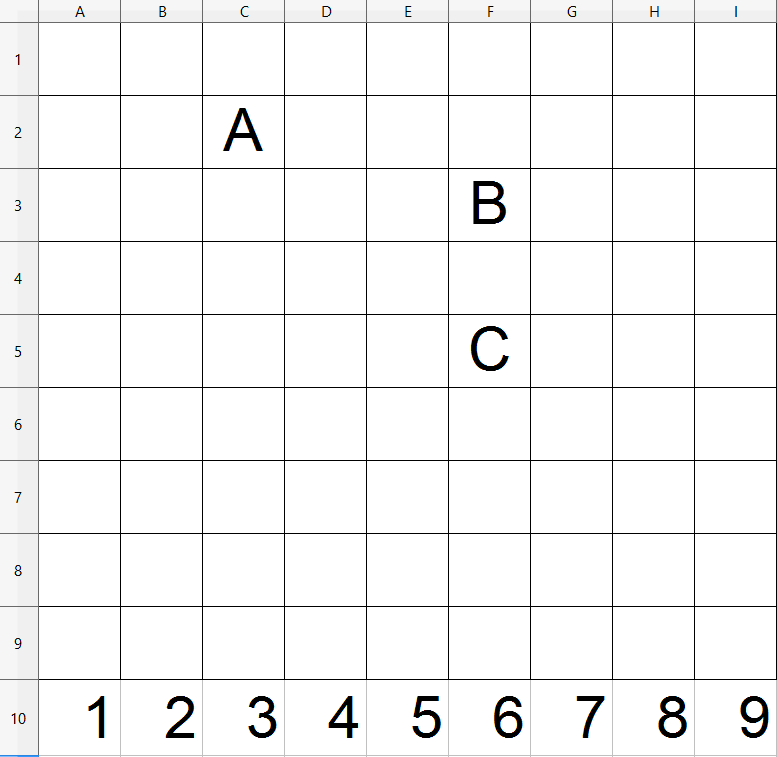 In the image below you can see that the distance between the rows of A and B is 1. The distance between the columns of A and B is 3. But this means we we need to pass couples into the function, which we don’t have. We only have rowindices. So what we can do here is pass the first queen as a paramter and zip the rest of the list with [1..]. This gives us the column distance right away! So conceptually speaking we would get a list [(columnDistance, rowIndex)] for all queens except the head. This will first of all zip with the infinite list, and then we will apply the predicate function to each element of that list. It just check wether the row distance between both queens is equal to the columndistance. This is pretty neat, isn’t it? Now we have all the pieces we need to filter our list. I’ve implemented some pattern matching algorithms in C#. They were part of a course I took at the university I study at. They are therefore hardly optimized for real life usage. They do represent the conceptual idea of the algorithms. The algorithms I implemented are Knuth-Morris-Pratt, Quicksearch and the brute force method. The brute force method is quite simple. We align our pattern with the text and every time we have a mismatch we shift our pattern one step to the right. This is very bad performance wise. Worst case we will match every letter of our text with every letter of our pattern, which equals to 0(np*nt). Imagine this for a text of 1m characters and pattern of 100.000 characters. This method is good enough for very small text and patterns but as you’ll see, the complexity of other algorithms is hardly bigger. The code is quite straight forward and given below. This algorithm is rather difficult to explain in a simple blog post. So bear with me as I try. The algorithm fully depends on the sigma-function. This function will return the largest prefix of the pattern, that is also a suffix of the part of the pattern that we have already matched. This is quite crucial to understand. Take a look at the image below. As you can see we have mismatch at the character ‘x’ and ‘a’. Using the bruteforce method we would just shift our pattern one step to the right. So the first ‘a’ would align with the second ‘b’ of our text. What KMP will do, is calculate the sigmafunction. You can see in the image, a suffix of the last ‘a’ in our pattern is ‘ab’ for example. ‘aab’ is one too but you’ll get it in a minute. This ‘ab’ is also a prefix of our pattern. Meaning, if we shift our pattern just the length of that pre- and suffix, we don’t have to match those characters anymore. Because we know for certain that all the characters before our mismatch matched. So we will shift the pattern as you can see in the image. And this is the idea behind the sigma function. Once you got it, it’s a very simple algorithm. if (ip &gt;= np)  //We have shifted out of our pattern, we are done. //We already calculated this, so just get it. //We have a mismatch, but K = 0, so we dont have a prefix. //We have match, step forward in the pattern! //We have a mismatch, jump back as much as the sigmatable tells us. This is my personal favorite for two reasons: 1) it’s fast and 2) it’s everything but difficult! This algorithm too, will do some preprocessing, although not as difficult to explain as KMP. What we will do is, for every character in the pattern, store the left most location in the pattern. E.g “abcabcd” will have 1 for a, 2 for b, 3 for c and 7 for d. Now, when we have a mismatch, what we will do is take the first character that comes after the entire pattern in the text. So in our picture above, we would take ‘y’. We then check to see if this character exists in our pattern. If it does not, we don’t even have to try matching, we skip it entirely, i.e shift the beginning of our pattern past that character (see the performance?). If it does exist, we shift our pattern the value of our table to the right and start matching from scratch. We don’t know if our first characters will match, but we do know there is going to match one. The performance boost this algorithm gets is from the parts where we can skip characters that don’t exist in our pattern. //We will just calculate the position of every character in the pattern. We then store the most right location. //Loop over the table and store our patternlength in it. (If we dont find the character, we have to shift the entire pattern!). //Loop over the pattern again. For every char we update it's position in the array. //This way, we always have the leftmost character in the array. if (ip &gt; (np - 1))//We shifted out of our pattern, found! if (it &gt; (nt - np))//We reached the end of our text with our pattern, not found! if (text[it + ip] == pattern[ip])//We have a match, continue. //We didnt have match, get the first character next to our pattern, and calculate the shift back. This is a link I ran into today. It’s a nice visualisation of how some of the algorithms I study work. Just for fun! I’m studying for my master’s degree at the moment and in my spare time I rebuilt some of the basic sorting algorithms I learned. There are many more, but I wrote a few of them to gain some insight and because it’s fun :). The algorithms are far from optimized for real-life usage, but the mechanics are correct. All the algorithms are built in such a way that they can sort any object type. To make this possible I used delegates to pass to the algorithms so they can extract the properties of the object that you need to sort on. To show how it works I’ve added a testing solution. It’s a simple console application that sorts arrays of given size and times how long it takes the algorithm to finish. The source code can be found on Github, or in the downloads (top navigation bar).